Traumatic brain and spinal cord injuries cause profound neurological deficits and long-term disability due to detrimental alterations in structure and function of neuronal circuits. 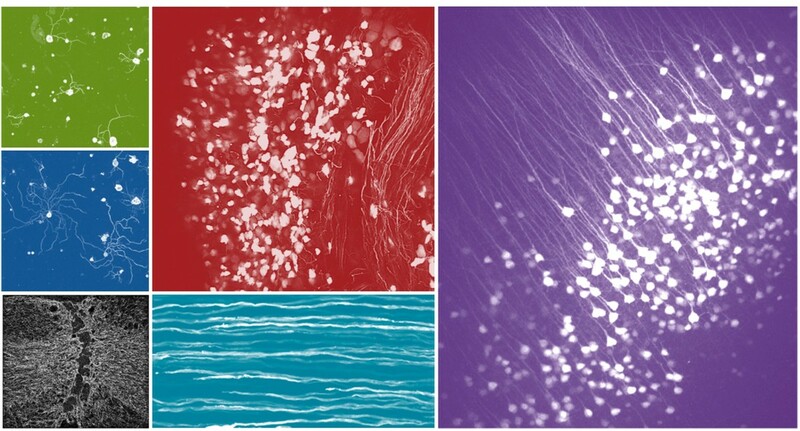 Although axonal injury is associated with several neurobehavioral and neuropathological characteristics, how changes in intrinsic neuronal properties alter interaction between neurons and non-neuronal cells remains a central mystery in neuroscience. Much of the progress to address this question has come from either studies that use in vitro surrogate models or in vivo endpoint studies. These experimental models, however, do not provide the spectrum of variables that influence the behavioral or systemic changes that occur in response to CNS trauma. It is our goal to shed some light on this important research topic and decipher the coding principle altering neuron circuit structure and function. To achieve this goal, we take advantage of a multidisciplinary approach that combines transcriptomics, bioinformatics, genetic, molecular and pharmacological approaches together with in vivo time-lapse multiphoton microscopy and whole-body optical clearing. By taking this innovative approach, we will begin to understand how to manipulate the self-repair mechanisms of the brain and spinal cord and help to design specific therapies aimed to improve neurological function and quality of life in individuals afflicted by traumatic CNS injury.